Another great week in SouthEast Alaska. 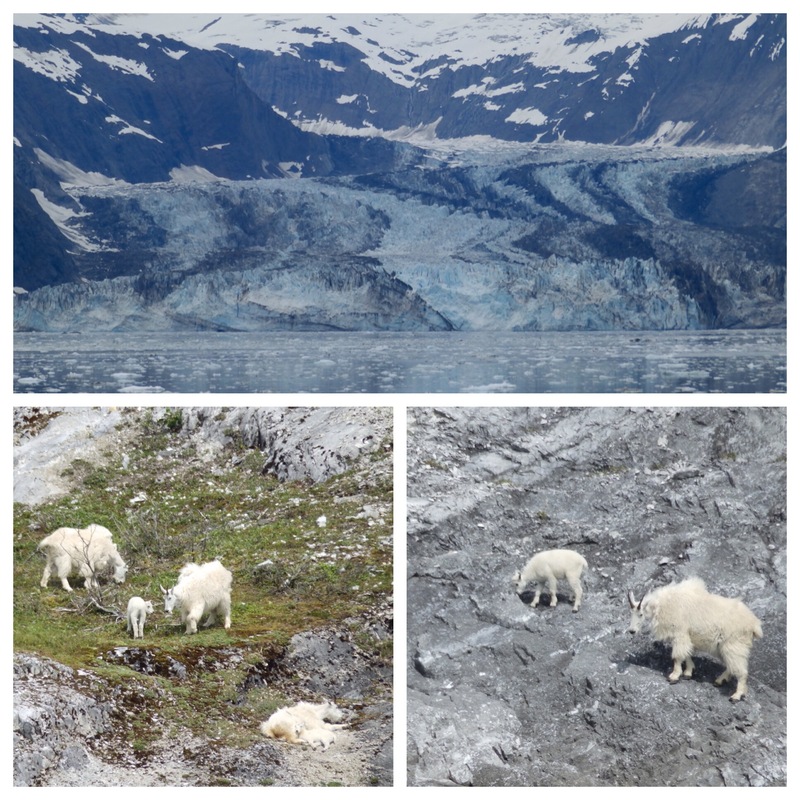 One thing that really makes Glacier Bay National park amazing for me is the wild life. Like I wrote before, this is my 5th summer in Alaska and I still run outside and take pictures like its my first. Glacier Bay is a special place. The majestic views are unreal and the wild life unmatched. The ship I’m on this season spends 1-2 days each week in the park. We travel past a couple places to see specific animals and this week and last were awesome. One of my favorite stops is to a spot called Gloomy Knob. Some days it lives up to its name and its gray and covered in fog with not a critter to be found. When wild life is around it is the Mountain goat we are there to spot and this was a particularly great goat day. My favs of course being the Kids. More often than not when we go by this Island and there is nothing around but this day was different, a group hanging out resting in the sun. Theses goats are used to boats coming by so they dont get up and run off and being on a relatively small boat we are able to get quite close. Another favorite spot is Marble Island. There is a large male Stellar Sealion haul out there which always reminds me of a fraternity watching the school football game. Several species of birds nest there as well but I’m all about the Puffins. I’m a little obsessed really. My favorite is the Tufted Puffin but this particular spot really only has Horned Puffin. A Ranger once told me there has been spotted a couple of Tuffted puffins but I have not seen one there myself but I haven’t given up looking for them. Today was another amazing day, sorry I know I say that a lot but SouthEast Alaska does that to a person. As we reached the end of our usual track up through the park to do a turn around we hang out at Johns Hopkins Glacier. This glacier was, I am told, listed by Time magazine as one of the most beautiful places to see. We can only get to a certain point as the park has a set boundary for how close you can go but even from this distance it is beautiful. Now as write this we are passing Lamplough Glacier, a tide water glacier and a small Catamaran sail between us and the glacier. Its amazing the blues the sun brings out. I’ll keep sharing my time here but If you ever get a chance to come to Alaska be sure and take it. I haven’t gotten into the interior yet but I can only imagine after being here.